The first time I saw an image of the floating temples of Wat Chaloem Phra Kiat my mouth dropped in awe. I thought I was looking at a photo of Bhutan at first. How had this been in Thailand all along and yet I hadn’t seen it on Instagram, on Facebook, and all over other travel blogs? There was hardly any info about Wat Chaloem Phra Kiat Phrachomklao Rachanusorn Temple (what a mouthful!) in English online, though I did see a mind-blowingly awesome drone video by a Thai tourist on YouTube and from that, I was sold. It became my number one must-see for my return to Thailand and you guys, it did not disappoint. It was just as amazing in person as the photos had promised. 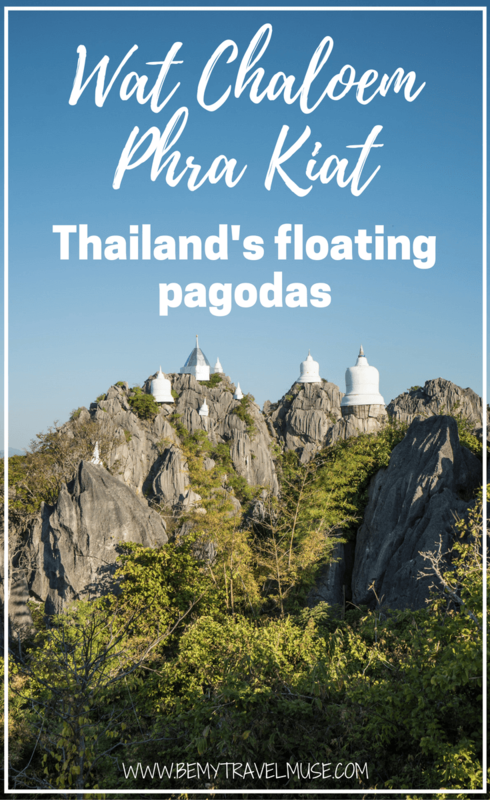 These pagodas dotting the mountain peaks were each carried up piece by piece by a revered local monk and a team of nearly 50 workers just over a decade ago. The amount of love and sweat that went into making this work of art and devotion a reality is astounding, especially when seen in person. What probably keeps most farang (foreign tourists) away is the accessibility of Wat Chaloem in Lampang province. There aren’t buses that can take you there, and it’s a solid two and a half hour drive from Chiang Mai by car, or longer by motorbike. However it’s easy to navigate to, and once you get out of Chiang Mai, the drive is quite pleasant along a relaxed highway that winds through the jungle and trees. I rented a car to go there as part of a larger road trip around Chiang Mai and, though I previously would have thought that driving in Thailand would be crazy and terrifying, I found it to be easy and laid back. The car rental set me back about 1000 baht per day which, when you split it with others, isn’t bad. You can navigate to it here. Alternatively, you can bus into Chae hom or fly into Lampang and take a taxi from there. Though honestly, both will be more annoying and a lot more expensive than just driving yourself. Another view – it’s astounding in every direction. Once you get to the entrance of the wat, you’ll need to buy a ticket for 200 baht, and a compulsory songthaew ticket for 80 baht per person. Once the truck is loaded up it takes you most of the way up the mountain until you reach a set of stairs to climb the remaining 500 meters up. The view along the way is gorgeous, but the most amazing part is, of course, at the top. Wat Chaloem might not be super popular with foreigners yet, but it is well loved by Thais, so plan on sharing it with a lot of other people if you go there on a weekend or during the middle of the day. Tickets officially start to go on sale at 7:30am and finish at 4:30pm, though you can stay up there until 6pm and when I showed up at 7:15am, they were happy to sell me a ticket and take me up a bit earlier. On holidays, it opens a half hour earlier and closes a half hour later. The morning is a fantastic time to go to see the mist still hanging in the village below, plus, you won’t have nearly as many people to share it with if you go early. There are also plenty of food stalls at the bottom if you want to grab breakfast after you go up. I didn’t find any places to stay online before heading out to Wat Chaloem which had me a little worried, but once I arrived I found it’s popular enough to warrant a local guesthouse with rooms for 500 baht each. You can find it here. Call 06-1997-6988‬ to check availability – the owner speaks some English. The guesthouse is about 15 minutes away from the wat, and it was a nice, clean place to stay. There’s also an open-air street food-style restaurant about 100 meters away serving up delicious food until approx 6:30pm, so it ticked all of my boxes. This discovery, amongst the others I made during my northern Thailand road trip, made me fall in love with the Land of Smiles in a whole new way. The friendliness of the people who were heading up and saying hello as I walked down, the breathtaking scenery, and the peacefulness of this province all had me wishing I had at least another month, maybe two, in Thailand. It’s hard to get enough of a place with so many hidden gems. Wat Chaloem, I’m so glad that you exist. What a gorgeous view! I’ve enjoyed reading your blog for a while now! I love seeing posts about less common places to visit. It’s great knowing that there are resources out there for alternatives to the tourist-packed attractions and popular cities. I’m inspired to try traveling more adventurously on my upcoming year long trek around the world! Thanks! turns out there’s a lot up there! Love the theme “Secret Thailand”, very catchy. Really like the font for the captions in the video and varying the color from white to black where necessary. What an awesome improvement. The drone footage is amazing and I am in awe of those who built those pagodas and would want to meet that revered monk. Very scenic. It is also neat to see the vegetation and canopy at that elevation, less tropical, more like the mid-latitudes, and still so green! I love how the climate and vegetation changes as you climb mountains. Thailand is starting to address pollution from burning vegetation for agriculture (“biomass burning” of sugar cane) so hopefully the visibility will be even more insanely greater in the near future (not talking about the mist in the valleys, that’s pretty)! You have succeeded in seeing Thailand in a new way at a different time of your life, congrats! Looking forward to seeing what new perspectives and hidden gems you find in Indonesia! By the way, Kristin, do you know what temperature it was up there in the early morning? It is neat to feel cold air in the tropics and good to know what to wear. Are they starting to deal with the burning season? that’s good news! It’s not underway yet, though. It’ll be hard to see anything once it is up north. I needed a fleece before the sun rose but not after. Hi Kristin, would it be really easy to drive from Chiangmai? It would be my 1st trip there and I’m not sure of the roads there..
That’s what I did! Roads are fine it’s just getting used to the way traffic moves. What car rental agency did you use? I’m heading to Chiang Mai with some friends next week and we were contemplating renting a car since it seems easier than separate forms of accommodation! This came up as we were planning our Thailand trip as well as we were researching and we knew we just had to go. We were looking up a bunch of ways to get there, but its the first time we’ve heard of someone driving. Did you need a special license to rent a car overseas? How did you navigate from ChiangMai to the temple – did you prepare a map of some kind beforehand? Was there some where to park at the temple? What did you think of the truck that took you up the mountain? You don’t need a special license to rent the car but if you get pulled over without an international license you’ll get a ticket. We didn’t ever get pulled over. I used Google maps, and there’s a parking lot, yes. The truck was fine – there’s no way around it! How long would you say that would spend here? Is it an all day thing or just a couple hours? I will definitely be checking it out in June! I just spent the morning there and moved on. Love to read your blogs for a big while. I like you put the ‘packing list’ in most of the places you went. It really helps. Lampang is my home town. There are many interesting places to visit both historic and nature wonders, and cultures of course. Did you have a chance to visit the Chae Son National Park near by this Wat Chaloem Phrakiat? It is where the very cold waterfall and the very hot hot sping meet. Put each leg on each side of the stream is wonderful feeling. There is area for tourists to camp also. The breakfast is the half-boiled eggs from hot spring!! I also travel the world both hiking and normal travelling. I have a fb travelling page just do it for fun 55. My next hiking will be the K2 base camp in August. If you have chance to visit Thailand again please let me know. Let’s explore Lampang in details!! Hi Pol that’s so cool! No I didn’t get to visit that spot but I’d love to go back with a local! I found the people to be so friendly and welcoming there. it was a very special experience.